Etiquette - The customs or rules governing behaviour regarded as correct or acceptable in social or official life. 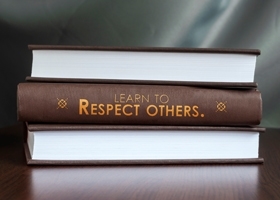 Etiquette promotes kindness, consideration and humility. Etiquette gives the confidence to deal with different situations in life, it gives you life skills. Etiquette enhances individual and corporate self image, it eliminates discourteous behaviour. Is it even relevant in the modern age? Today, just as it has been for hundreds of years of civilised society, a good standard of etiquette gives you the ideal social tool to navigate your way through the differing social events you encounter. At Polished Manners we give you the standards of modern etiquette needed to foster civility and respect towards others. Whether you are 8 or 80, we all deserve to live in a well-mannered society. We offer etiquette training for all age groups, both in workshops and on a one-on-one basis throughout the UK. We tailor each of our training programmes to your exact needs and expectations. This means you get modern interactive training targeted right at your weak spots. For professional etiquette training in the UK and overseas, contact us today. Thank you for a great introductory course to polished manners and etiquette for my three children. They have thoroughly enjoyed the lessons, which were well structured and swiftly delivered by Mrs Akano. She is an extremely professional tutor who is very enthusiastic and informative. Her lessons have been invaluable for my children. We look forward to more of Mrs Akano's engaging and humorous etiquette lessons in years to come.